The DS 60 is a stereo FET condenser microphone with twin rectangular capsules mounted 90° apart. Both capsules are dual-diaphragm; each of the four diaphragms is wired to an individual XLR output, via a 4-way breakout cable included with the microphone. The user can combine these four outputs to create an infinite variety of single-point mono or stereo pickup patterns, whether at tracking time or later — although the mic’s orientation would affect the utility of some of these patterns. For example, to use the XY or Blumlein patterns, the sound source would ideally be positioned between the axes of two of the diaphragms, whereas Mid-Side or any of the mono patterns would best be served if the sound source is on axis. For this reason, the microphone body features embossed “X-Y” and “M-S” legends to indicate proper orientation relative to the sound source. Recording all four channels independently allows pattern selection at mixdown; see the multitrack page for more information. The microphone body is machined from solid brass, and finished in black lacquer, also called “black chromium.” The single-layer metal grille is plated with gold. The mic ships with a shockmount (p/n 1942) and breakout cable (9-pin to 4-way 3-pin XLRM) in a padded flightcase. 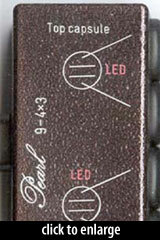 The Pearl Microphone Laboratory DS 60 is also known as: DS60.